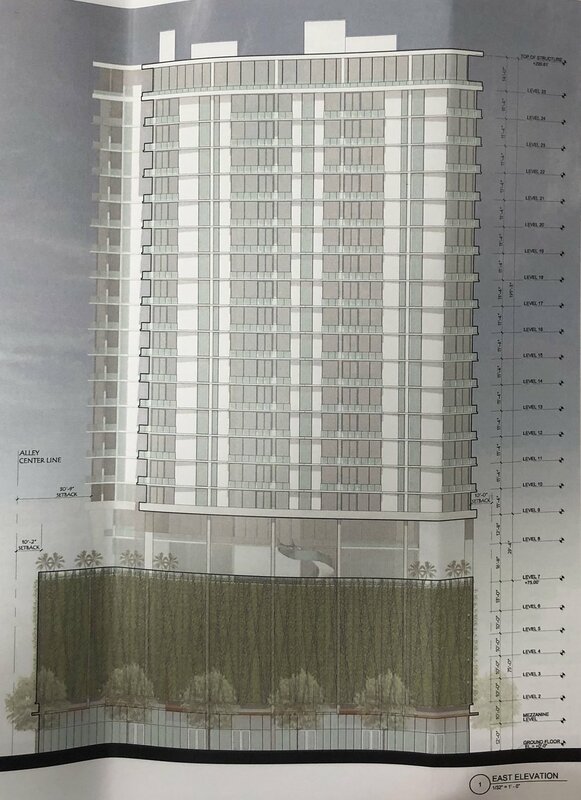 The proposed residential tower will be located at the southwest corner of 3rd Ave N & 2nd St N.
It’s getting difficult to keep up with all of the new development happening in Downtown St. Petersburg, FL. From new residential projects being announced to new dessert eateries opening, there’s never a shortage of exciting news surrounding the future of our downtown. According to site plan documents obtained from the city, the proposed tower would rise 25 stories (300 feet) and contain 100 residential units. While the site plan application doesn’t say whether the residential units would be apartments or condominiums, given the recent success of other nearby condo projects, these will probably be sold as condominium units. 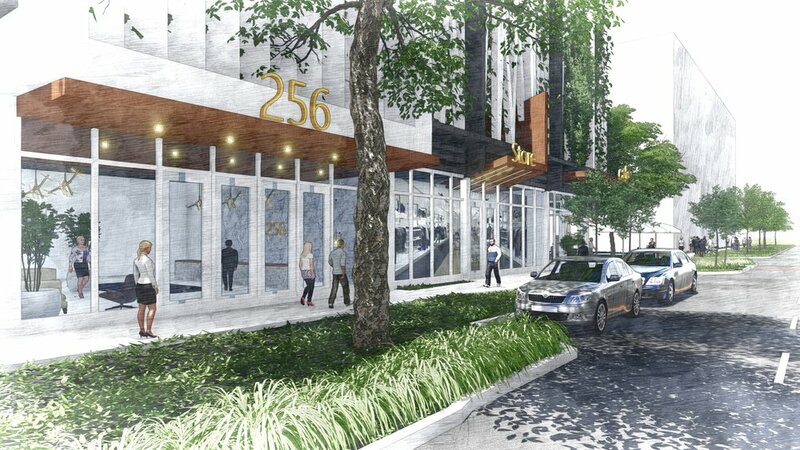 The development is a joint venture between Steve Gianfilippo, owner of the Cordova Inn and Station House, and Blake Whitney Thompson, CEO of BLAKE, which own Mandarin Hide, Trophy Fish, along with multiple other investment entities. Gianfilippo and Thompson are under contract to purchase the Fit2Run lot while Bill Edwards, owner of the Rowdies and Sundial retail center, currently owns the Sundial valet lot. However it is expected that the lot will be sold to either Gianfilippo, Thompson, or perhaps another developer, for this project. The project would contain 218 parking spaces in a garage that would be hidden from view behind aluminum screens with vertical vegetation such as vines or other greenery. The ground floor of the proposed building would have 7,000 square feet of retail space fronting 2nd Street North which would be divided into two 3,500 square foot units. On top of the retail space would sit a five-level parking garage containing 218 spaces that would be hidden from view behind aluminum screens with vertical vegetation such as vines or other greenery. It should be noted that the project only requires 149 parking spaces, so the developers are exceeding the minimum parking requirement. On top of the parking, floors 7 and 8 would have resident amenities including a swimming pool on an outdoor deck. Floors 9 through 24 would contain six residential units each while the 25th floor would contain three larger penthouse units. The project is currently seeking a streamlined site plan approval. If approved, it would join other active developments nearby including the 10-story Galaxy Hotel currently under construction as well as the proposed 19-story Bezu condo project to the north and the proposed 35-story Halcyon project to the south. Additional schematic renderings and a site plan of the project can be found below.